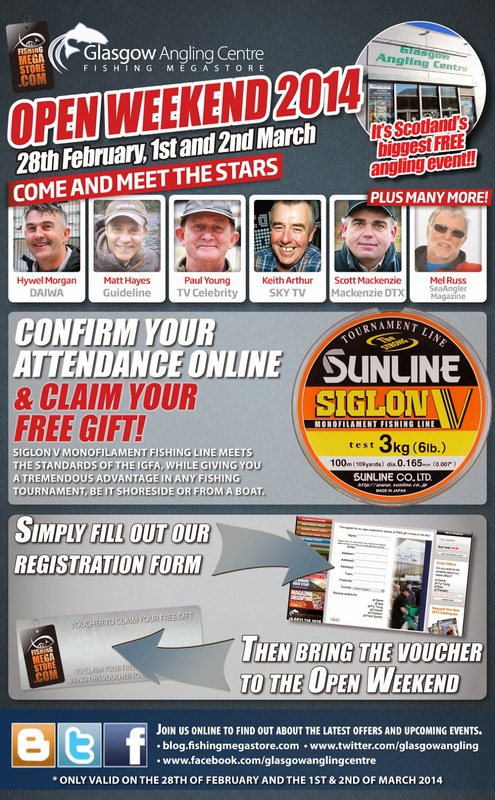 Fancy getting your hands on a freebie at Glasgow Angling Centre? Register your attendance of our Spring Event with us online and pick up not just one, but TWO spools of this fantastic Siglon V Monofilament absolutely free of charge! You will get two 100m spools of this top quality Japanese resin impregnated fishing line , joined for your convenience and in a choice of three breaking strains to suit many types of angling – for FREE! Simply register your interest by filling in this online form, and we will email you a voucher to print off or keep on your smartphone - then use the voucher instore on the 28th of February, 1st and 2nd of March 2014 and get your free line - simple as that, no purchase required! Please remember that it's one voucher per customer, and the voucher can only be redeemed instore on the 28th of February, 1st and 2nd of March 2014!